The Viking sagas—epic journeys that led Norsemen to raid, trade and settle over the known and unknown territories of the northern hemisphere. 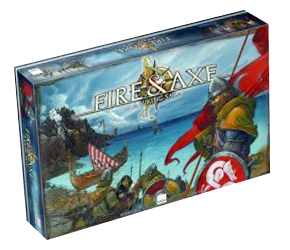 Fire & Axe: A Viking Saga is a lovely blend of rich theme and smooth mechanics; just my favourite style of game really. Unlike Hollywood Vikings there’s plenty of trading and settling as well as attacking and pillaging. The Saga cards give the game a nice epic feel and the production is top notch. Possibly at some time but since I have the first edition redoing it is a low priority at the moment, sorry. @UH : I just watched a Dice Tower video by Sam Healy (sp?). Turns out the only difference between your version and mine is in the set up. They streamlined some mechanics a bit. Otherwise game play is exactly the same.